Thirteen-odd billion years ago the Universe was born in an enormous explosion that sent absolutely everything hurtling outward--all the stars and planets, Earth, the Moon, the bits that would eventually become you and me and everything we know--and don't know. 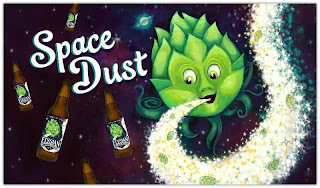 Come May 1, Space Dust, the latest in the Elysian Manic IPA series, will come drifting across the cosmos to select restaurants, bars and retail establishments. 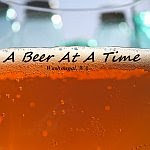 More than the ocean needs the cosmic light of starglow energy, you will love this beer. Space Dust is an (asteroid) belt of Chinook, Citra and Amarillo hops streaking across a fairly open-space grist of Northwest pale and touches of C-15 and Dextri-Pils malts. 70 IBU will deliver a good (VanAllen) belt of bitterness; 7.2% alcohol by volume keeps thrust at a medium burn; OG 16.8°P/1.068 SG if you're a Mission Control type. Space Dust will be available on draft and in 22-ounce bottles, with a cute little extra-terrestrial hop feller on the label. The Manic IPA series gives Elysian's brewers and their fans a chance to achieve escape velocity where our favorite hops are concerned. With a virtual space race going on these days just getting your hands on precious varieties, things are changing all the time. One thing's as sure as a man on the moon by the end of the 1960s--Space Dust is rocketing your way.